For such a small country, Belgium has an astonishingly wide range of breweries and beer styles. Add to this the fact that the number of different beers carried in many bars are often numbered in the hundreds (for example, Kulminator in Antwerpen lists over 400 beers on its menu, and the Delirium Café in Brussels lists over two thousand!) and someone new to Belgian beer can easily feel overwhelmed by the choice available. It's not for nothing that the Confederation of Belgian Brewers describes the country as "Beer Paradise." Many people will tell you that all beers brewed on mainland Europe are lagers. They're wrong. As in Britain, the flavour-free, mass-market stuff is generally lager. But as in Britain, the interesting beers are (mostly) what we would define over here as ales, that's to say top-fermented using ale yeast. The only significant exception is lambic which is spontaneously-fermented using wild yeasts endemic to the valley of the River Zenne (Fr: Senne). One note of caution: Belgian beers are usually much stronger than British ones. You might be used to drinking beer that's say 3.5% to 5%, but in Belgium you'll find that 5% is one of the weaker beers. 7% or 8% are common and even 10% or 11% isn't exactly rare. Fortunately you'll usually be served smaller amounts of beer than your normal pint, but do please take care. The majority of craft brewers are to be found in Flanders and it's probably no coincidence that the Belgian equivalent of Camra (Zythos) is a Flemish-speaking organisation. Wallonia, though having fewer brewers, does still produce some fine beers. This is not intended to be an exhaustive guide to Belgian beer (but see further reading for suggestions), rather an introduction to get the first-time visitor to Belgium started on the world's most wonderful beer culture. Beermad doesn't claim any great expertise on the subject, merely a love of Belgium and its beers and a desire to introduce others to the pleasures of this wonderful country. Belgium has three officially recognised languages, Flemish (almost, but not quite, identical to Dutch), spoken by 70% of the population, French, spoken by 25% and German, spoken by 5%. Although they are a generally laid-back people, Belgians (especially Walloons) can be somewhat chauvinistic where their language is concerned; using the wrong one can be taken as being very offensive. Fortunately the linguistic divide is, with the exception of the capital, pretty clearly delimited; Flemish speakers in Flanders (in the north), French speakers in Walloina (in the south) and the German speakers near the German border. Brussels is officially a bilingual city but despite being surrounded by Flemish-speaking areas and being geographically Flemish, the majority of its citizens (about 80%) speak French.This is probably the only mainland European city where using English can be justified. Indeed the two linguistic communities use English as a lingua franca rather than lower themselves to speaking the other language. Flemings (like their Dutch cousins) tend to be adept linguists. The vast majority speak excellent English (probably better than many English people) and many also speak French, German or other languages. Walloons, by contrast are often monoglots; a fair number speak English, but Flemish-speakers are unusual. The natural reaction of the average British drinker is to avoid drinking any beer that isn't perfectly clear. This isn't for any really good reason, but rather because of a number of myths which have become accepted as "common sense". Myth 1: beer's supposed to be crystal clear. The people who advertise flavourless crap like Bud Light would dearly like you to believe that anything you can't see through is wrong, but it's only in relatively recent history, since the introduction of glass drinking vessels, that anybody's been able to see their beer and realise that it isn't clear. So it's only since the introduction of glass vessels that beer has been fined to artificially remove the suspended yeast. Myth 2: the sediment's bad for you. If like me you enjoy eating Marmite, then you're already consuming vast amounts of beer sediment, as that delicious spread's main ingredient is yeast recovered from breweries. Indeed, far from being bad for you, there are positive benefits to consuming the yeast; it's an excellent source of many B group vitamins, especially B12 which can be lacking in the diet of vegans. And No, it doesn't give you the runs! Myth 3: it ruins the taste of the beer. Well, yes, maybe and no. Some beers undoubtedly do taste worse with the sediment, some don't taste any different and some even taste better. To me at least, Geuzes are awful if the sediment's mixed in. This is no doubt why special pouring baskets are common when serving geuzes; they allow the bottle to rest gently on its side (which is how it should have been stored) and let you pour your beer with as little disturbance as possible. A classic example of a beer which tastes better with the sediment in it is Duvel - a whole new delicious flavour takes over. So should I drink the sediment or not? Different people will find they prefer different beers with or without the sediment. Experiment a bit and see what suits your palate. There's no need to waste money buying one bottle to try without and one with, just pour about ¾ of the bottle into your glass carefully (the waiter will probably do this for you) and when you've drunk most of that, swirl the bottle to loosen the sediment and pour it in. If it turns out that you don't like it, then you haven't wasted much. If you do like it, it will have really been worthwhile. It's worth keeping a note of which beers you prefer served with or without the sediment, then you can remember for the next time. (The Beermad mobile app for Android has a facility for doing this). Belgian drinkers are probably the most adventurous in the world when it comes to drinking different styles of beer. It's been said that the average British drinker will drink only one type of beer in a year, whereas the average Belgian drinker will drink seven different types in the same period. As in most European countries, bland lagers, often claiming to be Pilsners, dominate the Belgian market. These will not be described here, since the discerning drinker will consider a Jupiler or Stella Artois tap to be more a warning than an enticement. There is no attempt to give an exhaustive list of beers within the various styles, but rather to make a few suggestions to start you on your way with Belgian beer. More in-depth coverage of the subject is left to authors such as Tim Webb or Chris Pollard, who have far more knowledge and than this writer. You will find such coverage in the further reading and useful links sections. Brewed using stale hops. Fermented using wild yeasts, bacteria and a cocktail of many other (often unidentified) micro-organisms. Matured in oak barrels for maybe 3 to 5 years in dank, cobweb-ridden chambers. Frequently so sour and acidic that the first mouthful can come as a shock. Often infused with fruits. Who but the Belgians would even think of brewing beer like this? What would a British Environmental Health Officer make of a lambic brewery? Lambics should be totally disgusting and un-drinkable beers, but on the contrary, they make some of the most delicious, remarkable and refreshing beers you could ever drink. Unfortunately, the lambic designation has been badly diluted by a Royal Proclamation in 1993 which stated that any beer containing even the tiniest amount of lambic can describe itself as a lambic. (The skeptical may be unsurprised to hear that one member of the Belgian government at the time was also a director of the huge Interbrew (now InBev) beer company). This has resulted in some of the larger brewers producing lager-based beers with a small proportion of lambic in them but selling them as lambics. The only real protection is the term Oude Geuze (or Oude Gueuze) which must only be used to describe a beer containing 100% (or nearly so) pure lambic and re-fermented in the bottle. The traditional cherry for making kriek is the Schaarbeek cherry, named after the Brussels district of that name. Sadly Schaarbeek cherries are very rare these days, so ordinary ones are generally used instead. Occasionally though, a lambic producer manages to get hold of some Schaarbeek cherries and the resulting beer is something special. Beermad was fortunate enough to sample some of the small amount of Shaarbeekse Kriekenbier that Frank Boon sent to the 2007 Brugge Beer Festival and it was truly delicious. If you see any kriek with Schaarbeek cherries in it, don't hesitate to buy some. Lambic itself is found in only a relatively small number of bars, mainly in the Payottenland and Brussels. It is the young, un-blended product which has not yet developed the acidity of the more matured versions. Faro is lambic sweetened with candy sugar. As with ordinary lambic, it is not widely available, although it is sometimes bottled. Geuze (sometimes spelled Gueuze) is a blend of several years' lambics, bottled in champagne bottles and further matured. Different brewers' beers vary widely, from the bland, mass-market geuzes of Belle Vue or Timmermans to the extremely sour and acidic beers produced by Cantillon. Fruit Lambics. Large amounts of fruit are infused into geuze for a period of several months. When well done, the contrast between the sweetness of the fruit and the sourness of the geuze can make for a deliciously well-balanced drink. The commonest varieties are kriek (cherries) and frambozen/framboise (raspberries) although other fruits such as grapes and peaches are also sometimes used. It's worth noting that some beers called krieks and frambozens (notably Liefmans) are not made with lambic, but with brown ale instead. Whilst some people (including me) enjoy these, the balance is generally nothing like as good as lambic fruit beers as they are often sweetened. However, if you ever get the chance to try unsweetened (ongezoet) versions, it's well worthwhile as in this (unfortunately rare) form, there's a lot more to taste. Yet more krieks and frambozens are produced using other (sometimes very ordinary) base beers. Mort Subite, originally brewed for the café of that name in Brussels. Sometimes still hits the mark with a distinctive flavoured Geuze although the fruit beers can be a bit on the bland side. Timmermans fruit beers are imported into Britain in large quantities. In recent decades, the amount of lambic in the recipe has dropped so much that it's not even discernable any more. In truth, Timmermans' fruit beers are more like alco-pops than fruit beers these days and are worth avoiding. The straight geuzes occasionally have a bit more lambic taste to them. Lindemans Frambozen is a tasty raspberry beer with a lot of flavour. Quite common on draught in Paris. Though in truth, the raspberry flavour dominates so much that this could almost be described as an alcopop. Hanssens geuze is somewhat mellower than most but is still so tasty that it's a beer which is easy to fall in love with. Oude Beersel make some of the tastiest lambics around. The original company went out of business in 2003, but fortunately production restarted a few years later and is every bit as good as it was. Frank Boon Sells some pasteurised beers, but the un-pasteurised ones are what you need to look out for. Oude Kriek has an amazing 300 grammes of cherries per litre. Mariage Parfait Geuze is excellent and stronger than average for the style at 8%. Cantillon is the only remaining traditional brewery in Brussels itself and brews geuzes so woody and sour that if they were the first of the style you tried, you'd almost certainly be put off lambics for life. If you like visiting breweries, then don't miss the Cantillon tour if you visit Brussels. The brewery's only five minutes walk from the Eurostar terminus and it can be guaranteed you've never seen a brewery like it. Can there be a town in Britain where you can't get a glass of Hoegaarden? Probably the most readily available Belgian beer after the awful Stella Artois (which in any case is actually contract-brewed in Whitbread's factories) this beer re-established the popularity of wheat beers in Belgium; they had all but died out by the mid-seventies. Unfortunately, Hoegaarden has been dummed-down a fair bit by InBev, who even tried (and failed) to move production to their Jupille fizz-factory in Wallonia. Perhaps the greatest service Hoegaarden has rendered is to remind the British drinker that a beer that's cloudy isn't necessarily off. The protein haze that is typical of wheat beers only disappears when they've had all the flavour filtered and pasteurised out of them. Spices are very commonly added to Belgian wheat beers, something that would make a German brewer blanche! Wittekerke is, bizarrely, named after a popular Belgian TV soap, but don't let that put you off; this is one of the most refreshing beers you could find on a hot summer's day. Vlaamsch Wit (also known as "Blanche des Flandres") is another tasty example of a Belgian Wheat beer. Brugs Tarwebier is another wheat beer that has been enjoyed on more than one occasion. Waase Wolf is so full-bodied it seems as if it ought to be difficult to get out of the bottle. It's different in character to any other wheat beer Beermad's tasted and is very nice indeed. Once upon a time, when drinking water wasn't to be trusted, every abbey brewed its own beer to sustain its monks and provide refreshment for visitors. Today, brewing is only carried out in a small number of monasteries, although many commercial brewers produce beers with monastic connections; some real, others imagined. Many of these beers are produced under license from the associated monastery, which receives a royalty on each bottle sold. Such is the commercial cachet of the abbey connection, a good many beers exist which, while trying to imply a monastic connection, actually have none. Indeed, many beers are named after long-defunct abbeys. Achel An established monastic brewery until the brewing vessels were looted by the German army during World War 1, brewing restarted here in 1998. Initially, Achel beers were somewhat disappointing, but they have been getting steadily better. Chimay is the largest and best-known of the Trappist brewers. There is some controversy over the question of whether Chimay beers should really be designated as Trappist, since most of the brewing is carried out by non-monks these days and after mashing, wort is transported off-site for fermentation and processing. The beers used to be of a very high standard, but they have deteriorated quite a bit in recent years. Beermad finds them at best unpleasantly cardboardy, at worst throughly undrinkable. Beermad actually poured his last couple of bottles of Chimay Blanche down the sink, they were so unpleasant. Orval beer is brewed to a style very different to the other Trappist ales. Only a single beer is readily available and it is very light and hoppy. Rochefort produces magnificent beers. Only the Westvleteren beers surpass Rochefort beers. Beermad buys Rocheford 8 by the case - that's how delicious it is. Westmalle is almost as commonly available as Chimay. The beers are well-crafted but the alcohol content of the Tripel can sometimes make it a little harsh on the palate. Westvleteren is the hardest to find and most worth seeking of the Trappist brewers. The abbey does not market or even distribute its produce. Any bar or shop wanting them has to send someone to turn up at the monastery and collect their supplies. The bottles don't have labels, the beers are identified by the colour of the cap (blue for the Extra 8, green for blond 10, gold for Abt 12). An eighth Trappist "producer" appeared in 2011, associated with the Mont des Cats monastery in French Flanders. However no beer is actually brewed in France, it's actually produced at Chimay. Initial reports from those who have sampled the beers suggest they retain the Chimay "quality". Beermad has also recently sampled beer from a new Austrian Trappist brewery, Stift Engelszell. Although showing potential, it's currently a little rough & ready. Westmalle Dubbel is a delicious dark beer, though slightly lacking in subtlety. Leffe blonde is probably the most ubiquitous Abbey beer, though as is normal with InBev beers, it's fairly unremarkable. For some reason, English drinkers generally mis-pronounce the name as Lef-fay, but since the Abbey de Leffe is in French-speaking Wallonia, the unaccented final "e" should be silent, as in Leff. Maredsous, brewed by Duvel Moortgat. There are dark and light variants - Beermad prefers the dark. Tripel Karmeliet is a very tasty blonde beer that even appears from time to time in British supermarkets. Beermad has found that the rarer 75cl bottles age wonderfully. Westvleteren beers are very hard to find, as they're only produced in small quantities and are not marketed or distributed by the abbey. The near-legendary Abt 12 is even harder than the rest to find as it regularly tops lists of the world's best beers (one suspects many of the voters have never actually tasted it, given how many vote for such a rare beer). If you find some, don't drink it - send it to me instead. Rochefort beers are more readily available than Westvleteren's and are well-worth tasting. Rochefort 10 weighs in at a massive 11.3%, whereas the 8 only hits 9.2%. Both are dark and delicious, though the 8's ABV makes it a bit easier to drink. La Trappe, brewed just over the Dutch border at the Koningshoeven abbey, on the edge of Tilburg, are a welcome non-Belgian addition to the Trappist marque. Although some beers (such as Isid'or) are not to Beermad's taste, the Dubbel, Tripel and Quadrupel are all very nice. St Bernardus Abt 12 is understood to be brewed to the same recipe as Westvleteren Abt. It's not far off being as good; whether the difference is due to variations between the two breweries' plant and methods or simply due to the mystique of the Westvleteren probably needs a blind-tasting to decide. Roman's Ename brand includes several very nice abbey beers. Probably the beers that might first tempt a lager drinker to try something more interesting, indeed many of them are brewed using a lot of lager malt. These beers vary from the very light (such as Brugse Zot Blond) to the golden and powerful (such as Duvel). They tend not to be spiced and are often fairly lightly-hopped. Beermad tends towards darker beers than these, so fewer personal recommendations here. Duvel is a beermad favourite. Readily available (often at surprisingly low prices in supermarkets), this is a classic beer. It allegedly got its name when a brewery worker commented "it's a devil of a beer" when sampling a test brew (Duivel is the Flemish word for "devil"). This is a beer which many people like to lay down and drink when it's aged a few years; Beermad has managed to keep some for five years and it was worth the effort. It is a classic example of a beer whose character changes entirely when drunk with the yeast in it (which to Beermad's taste makes Duvel even nicer). It's another beer whose name is regularly mis-pronounced by English speakers, who for some reason often pronounce it as it it were spelled "Duvelle" or "Duvalle". The correct pronunciation is more like "Doov'l". 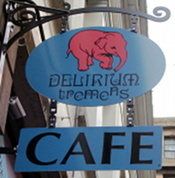 Delirium Tremens is a spiced 9% abv beer that will have you seeing pink elephants. That's because they feature on the bottle and glass, although it would be rather easy to drink enough of this dangerously delicious brew to see them elsewhere. De Halve Maan (Half Moon), in Brugge produces two blonde beers that are loved by one of Beermad's friends, Straffe Hendrick Blond and Brugse Zot Blond. (At least, we think they're brewed in Brugge. They may actually be brewed elsewhere, as the Halve Maan brewery is quite small. Red beers are a particular speciality of West Flanders. They get their colour from the dark malts used in their production. Like geuzes, red beers tend to be blends of old and young brews. To make the similarities greater, they are sour, although never so sour as the most extreme geuzes and often it is barely noticeable. Fears that Palm's takeover of the Rodenbach brewery would lead to a reduction in quality turned out to be un-founded, as they have actually invested a lot of money into revitalising production. Though some may question the wisdom of starting to sell Rodenbach in cans or (worse still) launching the dread Redbach, described by Tim Webb as "Dilute Rodenbach mixed with Boon Kriek and sold in American bottles for youngsters". Rodenbach is undoubtedly the classic of the type. There are two brews worth your attention; Klassiek and Grand Cru. If you just ask for "A Rodenbach" (Een Rodenbachje) you will be served the Klassiek, which is a blend of mature and new beer. Grand Cru is made purely from the aged beer and displays a much more complex flavour. Rodenbach Grand Cru was described by beer writer Michael Jackson as "the most refreshing beer in the world." Duchesse de Bourgogne probably loses a little complexity by not being bottle-conditioned, but is nonetheless a delightful, easy-drinking beer which is well worth seeking out. It can be wonderfully refshing on a hot day, as Beermad found on holiday in Maastricht during the heatwave of 2003. Echt Kriekenbier (originally called Echte Kriek) is a cherry-infused beer which Beermad believes to have Duchesse de Bourgogne as its basis. A well-balanced contrast between the sweetness of the cherries and the sourness of the base beer make this a tasty option. Very much a Walloon speciality, particularly from the west of the Hainault province, these beers are less common in Flanders. As the name suggests these are seasonal beers traditionally brewed during the cooler months of the year, to be drunk during the summer. Many Saison brewers can trace their history back to traditional farmhouse breweries. To Beermad's palate, Saisons have a rather cloying mouth-feel, rather reminiscent of Dutch Bok beers. So the only recommendations made here are of beers that others have enjoyed. Dupont is regarded by many other brewers as the finest example of a Saison. Silly is a very popular and widely available Saison. Brown ales are a particular speciality of East Flanders, but are of course brewed all over Belgium. Beers designated as Old Brown (Oud Bruin) are (or at least should be) blends of young and old beers. They are frequently quite acidic, although not as much so as lambics. Ideally, they should have a pronounced lactic overtone. These beers are often hard to find, with the only readily-available one being Liefmans, which has undergone a revival in recent years since being taken over by Duvel Moortgat. Some brewers infuse their brown ales with fruit in a similar manner to the lambic brewers. Although the sweet/sour balance is less pronounced, some of these are very popular. Liefmans are probably best-known for their very popular fruit-infused beers; they are readily recognised by being hand-wrapped in paper rather than having conventional labels. The Kriekbier is made with cherries, the Framobzenbier, which one friend of Beermad's is unable to resist, is made with raspberries. Unfortunately these beers are normally sweetened, though not offensively so. If you get chance to sample the rare unsweetened versions (ongezoet) grab it; the difference is incredible. Liefmans brown ale is a typical example of the Oudenaarde style with a slightly sour note to the flavour. Charles Quint (AKA Keizer Karel) is a stronger, dryer version of the style. Often designated "Special" though some, like the very readily available Palm Speciale, are pretty ordinary. Generally bronze or copper in colour and relatively low in alcohol (relative to the average Belgian beer, that is) many of these ales were developed as a response to the encroachment of Pilsner-style lagers in the 1920s. De Koninck, though perhaps the classic Belgian ale, lost its way badly for some years. Happily, things are looking up, with the brewery having been taken over by Duvel Moortgat whose record for investing in and improving their takeovers bodes well. There may be a bar somewhere in Antwerpen where the simple request "Één bolleke, alstublieft" fails to bring forth a distinctive goblet of De Koninck, but Beermad hasn't found it yet. The brewery, a couple of miles from the city centre is surprisingly small when you consider how widely available its beers are. Beermad has sampled bottles of De Koninck, but it only really comes into its own when served on tap. Cuvée de Koninck is a newer, stronger brew which tastes delicious on draught or from a bottle. Despite being in most respects an admirable country, the Republic of Ireland casts a long shadow over the world of stouts. Proving the adage that "the better the advertising the worse the product", Guinness is an over-hyped, mediocre stout with an ABV of barely over 4% on which the head is more important than the body. Fortunately, Belgian stout brewers don't feel they need to follow Dublin's example. Indeed even Guinness has recognised the folly of trying to sell caramelised gnats' piss in Belgium, so they export a heavier 8.8% version from Dublin. Belgian stouts tend to be higher in alcohol than average, are very dark and full-bodied and may be dry or sweetish. Hercule Stout from the Ellezelloise brewery is one of Beermad's all-time favourite beers. Too strong to drink much of, but delicious. Stoute Bie from de Bie is almost as tasty as Hercule, but less powerful. De Dolle Extra Export Stout is also delicious, but like Hercule, too strong to drink as much as Beermad would like to drink. In some ways, trying to categorise beers is a bit like trying to herd bees. You might get a few in the right place, though your right place may not be where somebody else's right place is. And there will always be lots that escape completely. The categories used in this guide are mostly very arbitrary; probably the only ones there wouldn't be much disagreement about would be the lambics (which can only be produced in one way) and the Trappists (though there are those, Beermad included, who feel Chimay's production is now so much removed from the monks that their beers don't really deserve the Trappist designation). Here are a few worth-trying beers that Beermad can't fit into any obvious category. De Dolle Brouwers (The Mad Brewers) produce a number of distinctive (and frankly, lovely) beers. Oerbier is one Beermad favourite; dark and malty, a beer that rarely fails to delight. The flavour can vary a bit, sometimes having a slight sour note a bit like an Oudenaarde Brown Ale. The lactic character can sometimes be a bit too powerful, probably when the beer's a bit too green. Extra Export Stout and Arabier are also worth trying. La Chouffe, in the Walloon Luxembourg province, produces a number of tasty beers that are all different. The brewery's acquisition by Duvel Moortgat has provided much-needed capital and distribution to make the beers more widely available. La Chouffe is the very tasty signature beer of the brewery. MacChouffe is a delicious Scottish-inspired beer. Houblon Chouffe is a beer for the hop-head. Het Anker's Gouden Carolus Xmas is best described as "xmas pudding in a bottle". Though despite disliking xmas pudding, Beermad loves it. Artevelde Grand Cru is dark and delicious. But be aware it's sold both bottle-conditioned and filtered. Kwak is a freely-available, deep amber beer which is served in in a very unusual glass which is shaped rather like a small yard of ale. To keep the glass upright, it sits in a wooden stirrup. This is a beer which can be rather disappointing from the bottle, but very nice from the tap. Saxo is one of a number of excellent beers brewed by Caracole (the Snail brewery) in Falmignoul (Namur province). The name refers to Adolf Sax, inventer of the Saxophone, who was born in nearby Dinant. Beers bottled for export by larger breweries often have their labels in English. But smaller brewers and bottles aimed at the domestic market generally just have them in Flemish and French. A few key words and phrases are worth knowing. Pleasant as it is to enjoy a few bottles of Belgian beer at home, nothing can beat getting over the channel and settling in a nice bar to sample a few beers. Despite being little-known (and often the subject of unfair derision), Belgium is a great place for a holiday. Whether your preference is for a seaside holiday, exploring the countryside or strolling round medieval cities, it's a country with something for everybody. And it's easy to get to. The big tourist destination is Brugge (annoyingly more often known by the English by its French name, Bruges). And it is indeed, a beautiful city, if perhaps rather "chocolate-box" and overwhelmed with tourists. For beer-lovers it's as close to heaven as can be imagined; within half a kilometre of the Markt there are probably over five hundred different beers to be found in a couple of dozen excellent bars. It seems there's hardly a month goes by without news of another new beer bar in the city. The coastal towns and cities, such as Oostende, Knokke-Heist and Zeebrugge offer what a beach-tourist would look for, though they suffer architecturally from having been extensively bombed during the World Wars and having been rebuilt as sympathetically as was Coventry. Brussels is a surprisingly enjoyable city. Like every European capital it has its share of utterly revolting modern architecture. But there are also a great number of interesting buildings to look at; from Art-Deco (such as "Old England"), futuristic (The Atomium) to the baroque (the Grand'Place/Grote Markt - quite rightly a World Heritage Site). Beermad is particularly fond of the Poechenellekelder; situated overlooking the Mannekin Pis, this ought to be the kind of bar that sells fizzy rubbish at inflated prices to tourists, but it's actually a wonderful bar with an imaginative list and friendly, efficient service. History buffs can visit the site of the Battle of Waterloo, though apart from the visitor centre and a number of memorials, there isn't actually much to see apart from a lot of attractive countryside. The battlefield isn't actually at Waterloo, it's at Braine-l'Alleud a few kilometres south. It got dubbed the Battle of Waterloo because Wellington's HQ was in a hotel (now a museum) in that town. If you only buy one guide book for your visit to Belgium, buy Tim Webb's Good Beer Guide to Belgium (see further reading). Visiting one of the specialist beer bars in Belgium, you'll find such a range of beers that you could be forgiven for thinking there was no point in anybody running beer festivals in the country as well. But they do. And very good they are too. Unlike British beer festivals Belgian festivals tend to have a number of small bars, each run by one or two breweries and showcasing their beers. And often you'll even meet the brewer on his bar. Zythos Beer Festival (generally just known as "ZBF"), normally in April, which is the Belgian equivalent of the Great British Beer Festival, run by Zythos, the Belgian EBCU member. Brugge (Bruges) is a relatively new (since 2007) addition to the beer festival scene. It's held in the Halletoren, right in the centre of the city. Beer Passion Weekend in June is a commercially-run (by Beer Passion Magazine) festival in Antwerpen, Beermad's favourite city. It's an outdoor festival in the Groenplaats, overlooked by the cathedral (and handy for Frietkot Max, Beermad's favourite frietkot). The Toer de Geuze, run by HORAL (Hoge Raad voor Ambachtelijke Lambiekbieren) occurs on an April Sunday every odd-numbered year. On that day, most lambic producers throw open their doors to visitors. A number of buses are laid on (very reasonable price, including a drink at each producer), each one visiting a different combination of breweries. The most obvious way to get to Belgium is by Eurostar, with a journey time from London to Brussels of under two hours. Prices (as of December 2011) start at £69 return, though the best fares are only to be had if you book well in advance. Unfortunately your Eurostar ticket no longer covers onward travel elsewhere in Belgium, an onward ticket can be purchased when booking. City Jet (which took over Belgian airline VLM in 2007) has direct flights to Antwerpen from a number of British airports (including London City, Manchester and Glasgow). Though not a budget airline, prices can be reasonable. And flying to Antwerpen airport (only a small distance from the city centre) is very convenient. P&O Ferries have daily overnight sailings from Hull to Zeebrugge. Residents of East Anglia may find the Stena Line sailings from Harwich to the Hoek van Holland a good inexpensive option. Their Dutch Flyer ticket covers a journey from any East Anglian railway station to Harwich, the sea trip, and onward travel to any Dutch railway station. The direct line from Rotterdam to Roosendaal connects with services to a number of Belgian cities (some trains run through all the way from Rotterdam to Antwerpen and Brussels). So you only need to add the cost of a ticket from Roosenaal to your destination. Belgian railways (NMBS/SNCB) has an extensive network (network map (PDF)) of routes. Trains are frequent and reliable, fares are reasonable. (So many things our own railways could learn)... Tickets are reduced in price at weekends and if you know before crossing the Channel when and where you're going to travel, you can book in advance on their website. De Lijn runs the Flemish bus network, as well as tram services in several Flemish cities. TEC is the Walloon bus provider. MIVB/STIB runs buses, trams and metro services in Brussels. There are many good deals to be had on tickets, including day/week cards and multi-trip tickets. Usefully, your ticket is valid for an hour from when you validate it at your departure station or stop, so you can make multiple journeys on it in the zones it's valid for. Note that you must validate your ticket as soon as you board the bus or tram, or before crossing the line onto the metro platform. The authorities have been cracking down heavily on the problem of illegal passengers (zwartrijders in Flemish) and are unlikely to accept any excuses. The most comprehensive guide to Belgian beers is probably the late Michael Jackson's Great Beers of Belgium. The only major weakness of this book is that Jackson seems reluctant to say anything negative about any beer, which suggests that his association with the Confederation of Belgian Brewers may have been a little too close for him to be regarded as a truly independent writer. Despite this, the book is highly recommended. For "on the spot" information on drinking in Belgium, by far the best guide is Tim Webb's Good Beer Guide to Belgium which contains details of bars in every major (and many minor) town in the country, together with extensive brewery and beer listings. Tim also publishes Lambicland (with Chris "Podge" Pollard & Siobhan McGinn) which is a good guide to Lambics and the Payottenland bars in which they can be enjoyed. These and several other useful titles (such as Around Bruges in 180 Beers) are available from Books About Beer. Classic Beer Styles: Lambic by Jean Xavier Guinard is a good read if like me you fall in love with this particular beer style. Zythos (Flemish-language site) is the Belgian equivalent of Camra. The Belgian beer pub map will help you find some of the best beer bars in Belgium. 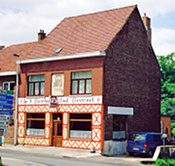 HORAL is the umbrella organisation for Lambic brewers. Michael Jackson's website has been kept up. Although not updated since his death in 2007, it still contains much useful information. The Belgian Beer Board is a site with a huge amount of information about Belgian beers and breweries. It's regularly updated by site-owner Filip Geerts and features a lively bulletin board where enthusiasts from around the world share information. Visit Flanders provides tourist information about the Flemish part of Belgium. The Belgian Tourist Office has tourist information about Brussels and Wallonia. Famous Belgians, though rarely updated, is the antidote to that old favourite challenge "can you name three famous Belgians?"